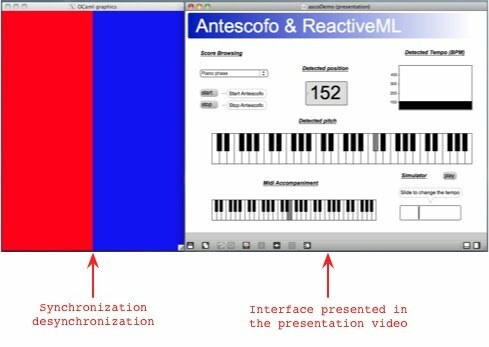 You can find here video demos of some applications of Reactive Asco. The code corresponding to the examples is available here. 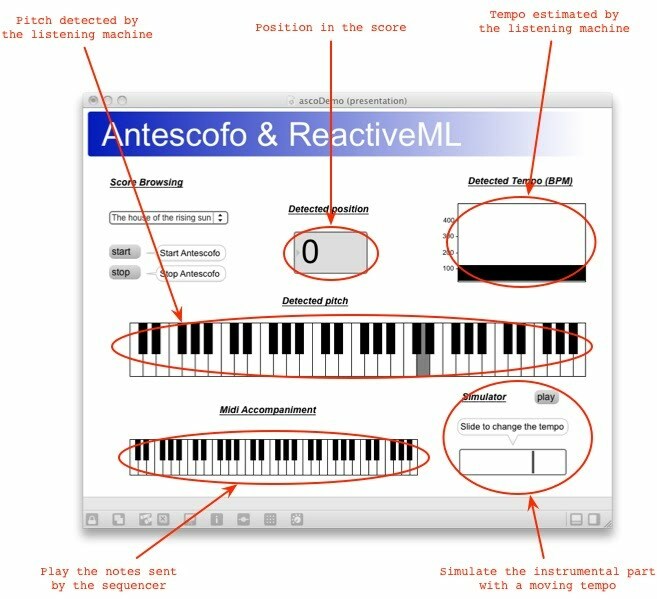 Our application works in interaction with Max/MSP via UDP sockets. Max send the output of the listening machine to our sequencer. Then the sequencer uses these information to send control messages in turn to Max/MSP. Here, the sequencer controls a simple MIDI synthesizer. This first video introduces the operation of our application with a very simple example: a french folk song called "Au clair de la lune". Piano Phase is a piece written in 1967 by the minimalist composer Steve Reich. In this piece, two pianist alternate between two modes of execution: synchronization and desynchronization. green flashes indicate that the first pianist is playing the first note of the sequence. red flashes indicate that the first pianist is playing the first note. blue flashes indicate that the second pianist is playing the kth note (first 1 then 2 then 3...).